Model rocketry is a great hobby and a fun way to learn some basic engineering skills. Most kids never go beyond buying a basic rocket kit, building it, and flying it once when they are in grade school. The kids that are destined to be engineers however, are not content with that. They want to know more so they can make their rocket fly higher, lift heavier payloads, or win competitions. They start designing their own rockets, and learn how to calculate such things as drag coefficient, center of pressure and center of gravity. It is no coincidence that many astronauts, engineers, and scientists flew model rockets as kids. An understanding of how a rocket motor works is also required, and soon they are familiarizing themselves with terms such as total impulse, burn time, coast time, and average thrust. They start to get a basic understanding of the strength of materials, when their rocket with balsa fins, shreds into confetti when they put too powerful of a motor in it. They soon discover that the higher the rocket flies, the more likely they are to lose it because the parachute deploys at the rocket’s apogee, causing it to drift far downrange. That provides an incentive to design and install a dual deployment parachute system for their rocket using an altimeter. This deploys a small drogue parachute at apogee letting the rocket drop at a rapid controlled rate until it gets to a couple hundred feet above the ground where the altimeter deploys the bigger main parachute allowing the rocket to make a soft landing close to the launch pad. 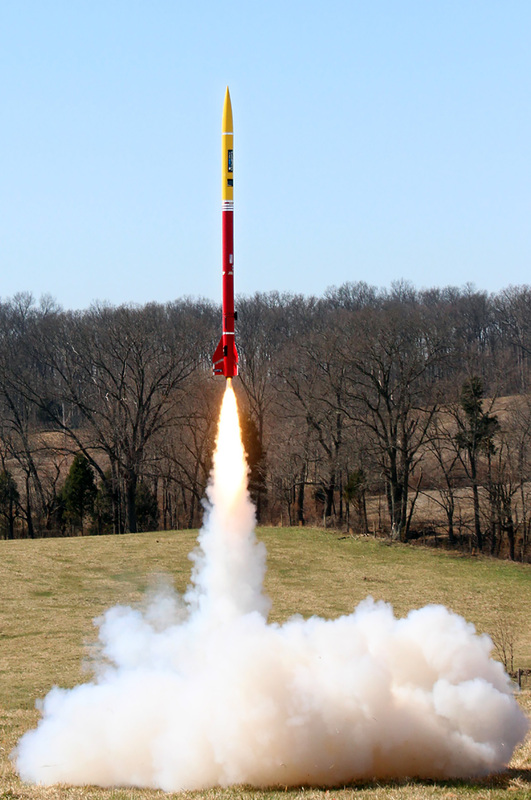 To learn more about model rocketry, contact your local rocket club. For the Evansville area, the closest rocket club is Laünch Crüe (website: launchcrue.org), NAR Section 519. Laünch Crüe is based in Holland, Indiana and supports the Rocketeers of Southern Indiana, as well as the surrounding tri-state region. Members are all ages, and come from all walks of life, but all have rocketry as a common interest. Every month they have a business meeting and a sport launch. In addition to the regularly scheduled launches, they also host four larger regional rocketry events that include competition as well as sport and high power flying. Rocketeers regularly come from all over the Midwest to fly with them. Club members enjoy all aspects of competition, sport, and high power rocket activities and they regularly obtain 10,000′ FAA waivers and allow flights of up through “J” class motors at their home field. They also sponsor rocketry demonstrations and workshops for all ages interested in learning more about the exciting hobby of model and high power rocketry. Feel free to contact any of the club officers on the Laünch Crüe website to learn more.